Social media is becoming powerful day by day. The Year 2016 was no exception and social media remained the most influential medium to amplify your message rather than media or PR. Not only businesses saw their growth in using social media but politicians also used it as their spokesperson. Social media proved its might when it was considered biggest catalyst behind Britain's Brexit referendum and U.S. president elections. All the social media platforms Facebook, Twitter, Instagram, LinkedIn, Snapchat etc. saw a major boost in their numbers of users. Facebook started streaming live videos through Live Video, Instagram was rigorously posting Snapchat's funny videos and there was practically a war between these platforms to bring you latest information about business, entertainment, politics, technology, and sports. Overall, now an average user is spending almost two hours of his day time on any social media platform which is approximately 10 percent of a single day. 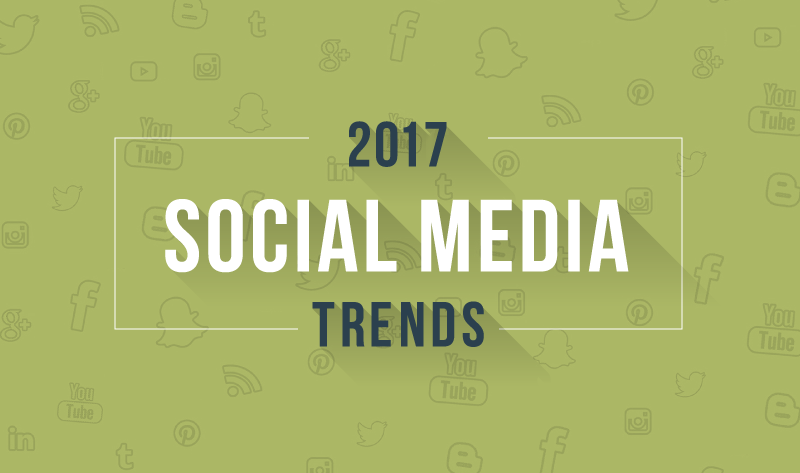 2017 also looks forward in the fight of social media and there will be some trends which we could see in coming days. During U.S. elections there was much fake news were trending which contained morphed images or statements of candidates from both Republican and Democrats side. These fake news were provocative, derogatory and quite personal to the candidates. No doubt, the 2016 elections were considered worst elections ever in U.S. electorate history. Gradually social media platforms like facebook and twitter took it seriously and started removing them. Though it remained a problem that these fake news sites were trending and were getting decent hits so naturally coming earlier in search rankings. In 2017, social media websites have hinted that they will try to discourage people from posting such fake news which is derogatory or insulting or coming from an unverified source. Messenger apps have been successful in gathering much attention of users than social media. Whatsapp was successful in touching 1 billion users which are far greater than twitter's 317 million monthly users. If we put together the no. of users of four mostly used messaging apps (Whatsapp, Facebook messenger, Viber, Wechat) then it will be more than combined users of Facebook, twitter, and Instagram. So, businesses are looking messaging apps with hopeful eyes and surely we will see more investment in messaging apps than social media. Social media users have a tendency to tell their stories to their friends and businesses always needs some good storytellers to promote their businesses. Since social media has become strong among masses market has seen a vast potential in digital promotion but a constantly changing social platform requires a good story telling to remain relevant in the business. Nowadays, blogging has become a hot cake property for businesses to increase their viewership and convey about their product and services. 2017 will also see many business ventures putting their money in blogging and promoting it on the social platform. Soon twitter is going to include a "buy" button in its ad, so retailers could now sell their product on twitter, it will give a major boost to those businesses which are promoting their business on twitter. Many clickable options mean more business for retailers and more competition between social media websites. According to the Pinterest.com, a majority of their users agree that they like to purchase a product only after seeing it on their website. It proves that a dedicated user likes to purchase a product which he sees on his/her favorite social media platform. Virtual reality and augmented reality have already made headlines and every major tech company is investing heavily in such technologies. It will be a no shock to the people if virtual reality makes into the social media arena. Facebook has already gone ahead with Oculus, though still in transition period virtual reality and augmented reality can become next level in social media technology. Since Facebook has added "live video" feather in its wings a continuous debate is going on about its future. Many experts think that it has a great potential for business perspective as apart from Facebook YouTube, periscope have also started streaming live videos. Facebook has also said that soon they will allow a 360-degree live video facility for their live users and up to 4-hours video could be streamed on it. It could be a great platform for businesses to promote their live events to raise awareness about your brand, product, and services. There is a constant argument over the use of an employee to promote your business but in previous years many businesses who were using this strategy are getting a better return on Investment as their clients become friends with their employees and it becomes a sense of acquaintance among them. There is no doubt that social media has become a de facto parameter for every business and organization to increase their viewership and soon there will be information available which these social media giants want you to see. Every information will be clustered and filtered as per their norms and businesses will go up and down with just Facebook's algorithm changes. we should be ready to adapt to such situations. Ruchhir Agarwal is the Chief Executive and Technology Officer at E2logy, an enterprise application development company that brings innovative solutions to the digital world. He is a technology enthusiast and a passionate blogger. Ruchhir leads the company in developing custom web and mobile applications that exhibit powerful features and latest technology.